One major feature property owners take for granted is their roofing. The roofing on our buildings takes daily abuse from the Texas weather and requires regular maintenance to ensure it will last for a long time. Many property owners and managers put off their roof repairs because of the sometimes considerable cost and the time needed to allocate to this type of project.. Which is why it’s very important to pick a roofing system that meets the needs of your building and business. Once you’ve chosen your roofing system, having trusted, experienced, commercial roofing contractors can help greatly with maintenance and repairs, taking a lot of the stress away from you. Your commercial roofing contractor can help you to maintain your roof for many years and ensure you get the most out of your roofing option’s lifespan. Flat roofs have some basic issues and challenges. For example, drainage can be a big problem if the slope is not right. A drainage problem can lead to water leaks and mold developing. Watertight seals are the answer to this problem. Plastic or rubber can also be used. Another option would be to use some pitched roofing along with the flat areas, because nobody wants water pooling on, in, or around their property. You need to use proven, successful methods and quality materials to ensure that your flat roof is installed properly and maintained well. 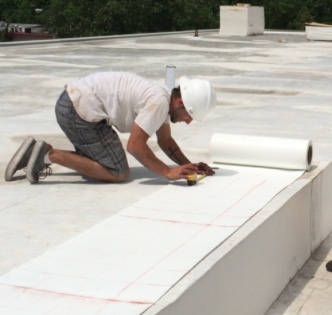 The maintenance of flat roofing on a commercial building is another issue often cited by building owners and property managers when deciding on a roofing system. Some don’t choose to install a flat roof on their building due to being misinformed. While there are legit concerns, we believe the key is to use the correct materials, installation methods and procedures for installing the roof. Flat roofs work great in the dry, warm and windy Texas elements. Flat roofing systems use less surface area opposed to pitched roofing systems, which can have double the total square area of a flat roof. They also do a good job of reflecting heat on sunny, warm days, which helps to insulate and cool the inside of buildings too. In warmer areas, every cooling opportunity is helpful in keeping energy costs low. 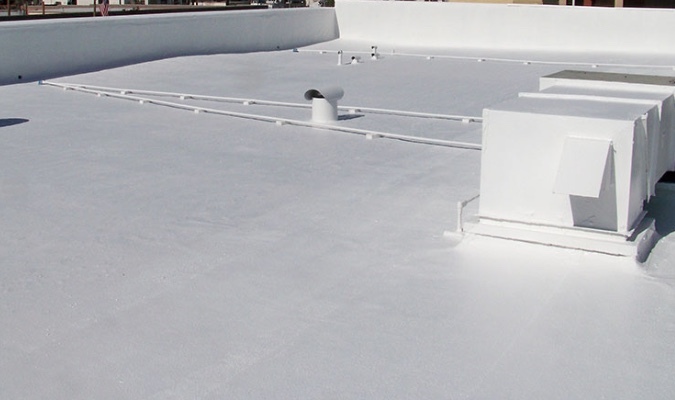 Commercial flat roofs have definite requirements. Unlike sloped, pitched roofs, which rely on gravity to shed water and material from them, flat roofs use drains and rely on water resistant membranes to protect the building. The term ‘flat’ is a little misleading — no roof is totally flat or water would pool on it. “Low slope” is a better term for what’s commonly called a flat roof. Flat roofs have at least a 1/4 inch of slope per foot (or more) so that moisture can flow downhill to the drainage system and then off the roof and down to the ground. EPDM Roofing – This roofing option is constructed from recycled rubber materials and is one of the most recently developed methods of flat roofing systems. Since EPDM is made from recycled materials, it’s an environmentally friendly choice. In addition, the rubber material used can help add insulation to your roof and attic, which can lessen your heating and cooling costs. One of the biggest questions that property owners have with flat roofs is leaking due to standing and ponding water. EPDM is extremely moisture resistant, making leaking a rare occurrence. Built-Up Roofing or BUR – BUR roofing is the oldest type of flat roofing system and has withstood the test of time. This method of flat roofing uses tar and gravel, which creates a waterproof layer on the top of your roof. This durable roofing material can last between 10 and 15 years with regular routine maintenance. The use of gravel will protect against water and the sun’s UV rays which could otherwise cause gradual damage to your flat roof. Modified Bitumen Roofing or MBR – This roofing material is a lot like the BUR method mentioned above, but with additional wear layers, called cap sheets, for more strength and durability. Its applied using a method that creates large, seamless areas on your flat roof. Because of its application method and using added layers, MBR flat roofs are a durable and low maintenance choice. The material used in MBR roofing is recyclable after its lifespan, which makes it environmentally friendly. Your roof is not something that you want to take for granted. It’s critically important to pick the proper roofing option for your building’s needs and to properly maintain it over time. If you need help with maintenance, or have questions about your flat roof, it’s important to reach out to trusted, experienced commercial roofing contractors. With decades of experience, we’re proud to offer our services to help you repair and maintain your flat roofing system. Give us a call today at (512) 333-7663 and see how we can help you extend the lifespan of your flat roof.